Wow, this is my second Chinese food post within a short amount of time, I didn’t plan this. It’s just that I recently stumbled upon this article on 7×7’s website discussing the top 10 places to get a good meal under $10 in my neighborhood, the Inner Sunset. I am pleased to say that in the 8 or so months that I have lived in the neighborhood, I have tried half of the restaurants mentioned. Not too bad for someone who usually cooks at home. Just putting it out there, I love good Chinese food. Trouble is, I have had very little good Chinese food in my day – despite the fact that I live in San Francisco for Christ’s sake! I believe excellent Chinese cuisine exists, the problem is if I am ordering Chinese its because I don’t want to cook and I am hungry. So it needs to be close – by way of delivery or within a few blocks of my house. A few months ago, I was suffering from a bad case of the stomach flu, so my dear friend Scott drove me home. Scott has been working in the kitchen for the better part of 10 years and knows the best places to eat in the city so when he says a place is tasty I take his word for it. No questions asked (except for what I should order). While he was driving me through my neighborhood he was pointing out various places where delectable morsels could be found, but since I was on the verge of barfing I wasn’t retaining much of the tidbits he was throwing out. I vaguely recall him mentioning a Chinese place where you could order any, and he meant ANY, part of a chicken dry fried. A week later, when I was up for eating real food again I wracked my brain for the name of the place he had mentioned. Because of my decrepit condition at the time, I couldn’t for the life of me remember which Chinese place he had pointed out amidst the dozens that dot the streets of my neighborhood. So bless the foodie gods who dropped the 7×7 article in my lap, for it talks about the very same restaurant! Which brings me, finally, to the afternoon lunch Matt and I spent at San Tung. When we walked in I noticed that we were the only non-Asian patrons in there, I took this as a good sign. If the food is authentic enough for those from the same culture, its good enough for me. We were seated at a table with some other people sitting there. Sort of family style, we just didn’t share food. While I was scoping out what they ordered I noticed the illustrious dry fried chicken and I drooled a little bit. (For a look at the complete menu, click here). San Tung has an extensive lunch menu so we couldn’t help but take advantage of the cheaper prices. 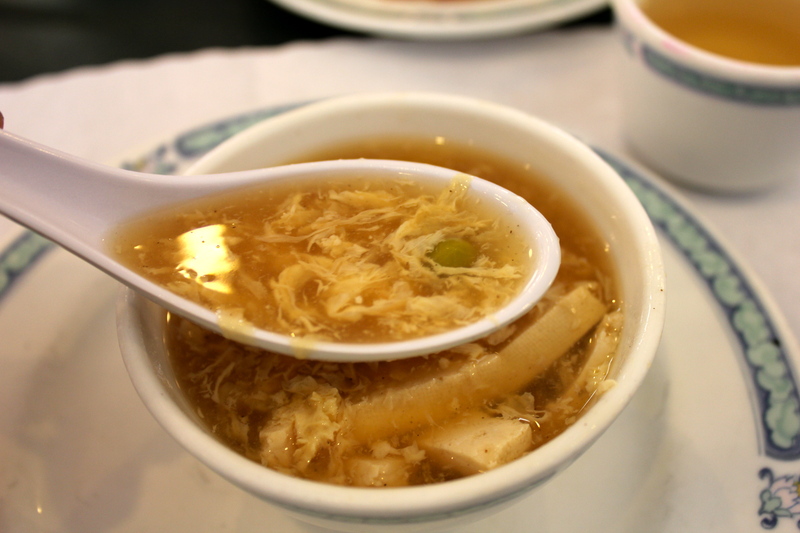 As we scanned our options we sipped on some beautiful Hot and Sour Soup. This is one of my favorite soups, I have been know to eat it by the quart. Tofu, peas, willow tree fungus, bamboo shoots, and delicate whipped egg swam happily in a tangy yet slightly spicy broth. 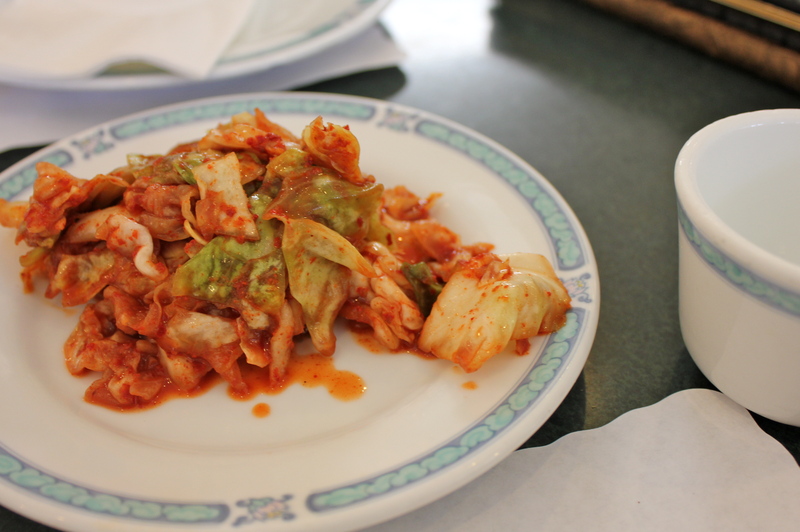 In between sips of soup we nibbled on some complementary kimchi. Both of us LOVE this stuff so much, I think we asked for 3 plates throughout the course of the meal. Neither of us were starving, but next thing we knew we had ordered 4 dishes, plus rice! I pray my waistline will forgive me. 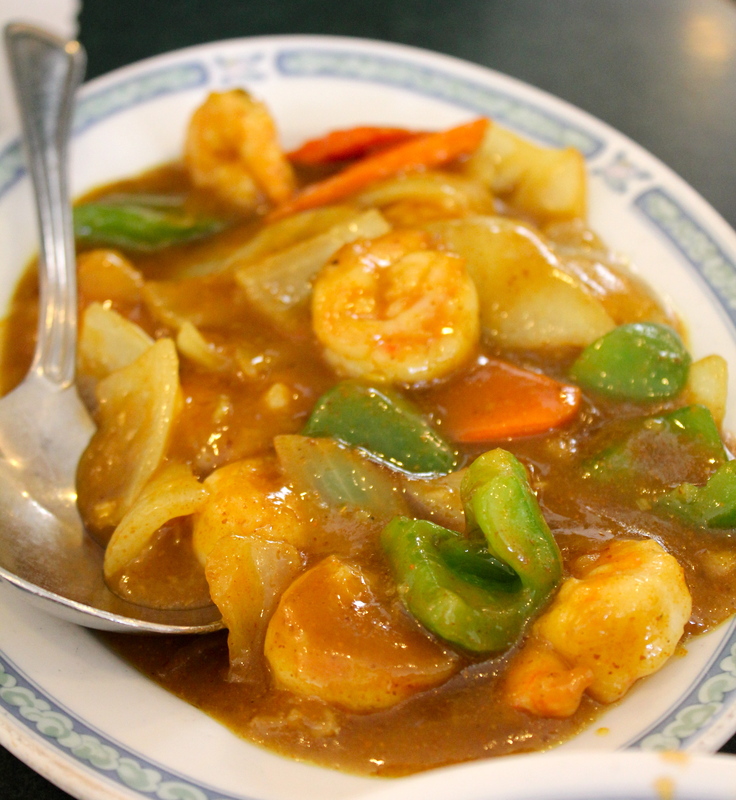 The lunch menu special of Curry Shrimp – complete with crunchy onions, green bell pepper, and thinly sliced carrots. 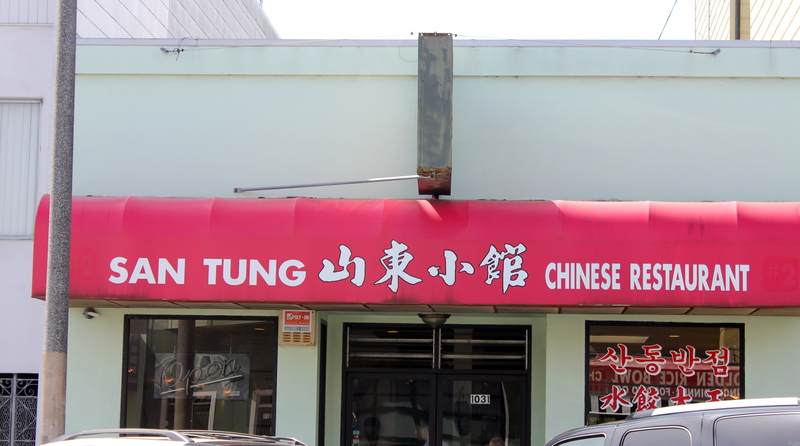 Unlike a lot of places offering shrimp, San Tung did an upstanding job of not overcooking the succulent meat. 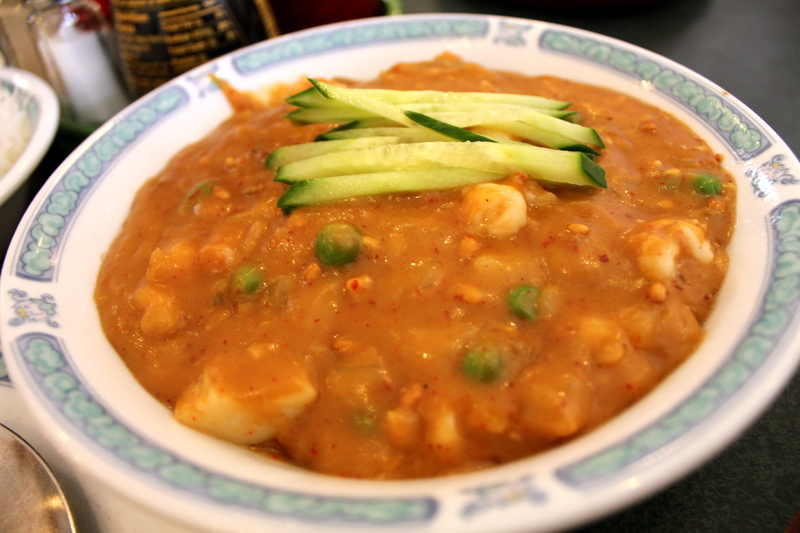 The sweetness of the shrimp and the slight kick of the curry were quite the pair atop a small mound of rice. 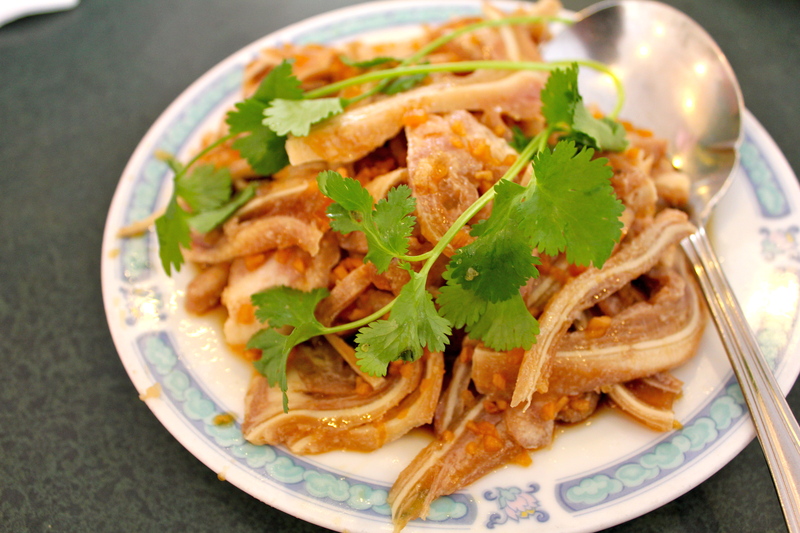 We got brave and ordered cold Pig’s Ear with a five spice rub and soy garlic sauce. The flavor was nice, but preparation was not my cup of tea. The fat on the ear was slightly congealed giving each bite an overly gelatinous mouth feel. I’d try it again, but I think I would prefer them fried. The star of the meal was hands down the dry fried chicken Scott recommended. By far the most wonderful fried chicken my mouth has ever had the pleasure of meeting. The golden brown, perfectly crisped skin burst open to reveal tender and juicy meat. We ordered the sauce on the side, which is definitely the way to go. Doing so allowed us to appreciate the heavenly taste of the meat on its own. The sauce though. The sauce. 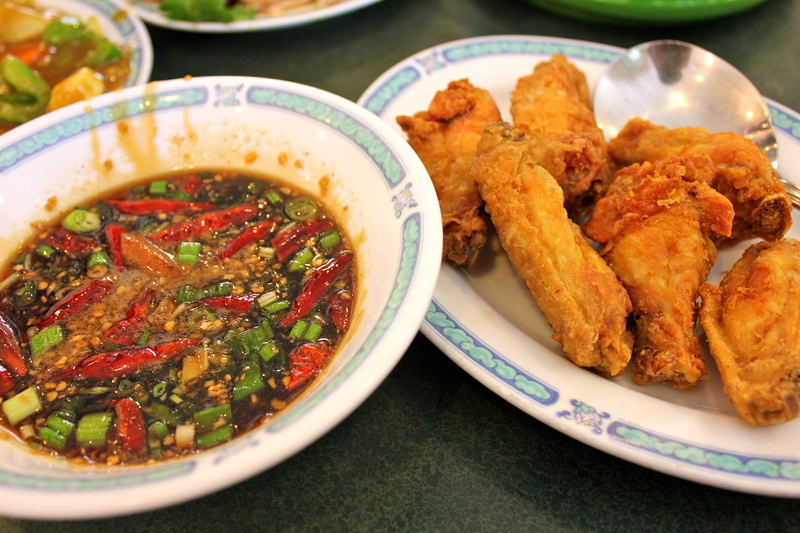 Whole chilies, diced green onion, and minced garlic basked in a sweet yet spicy sauce that clung to every crevice of the chicken each time we let the two meet. This is the dish that will keep me running back to San Tung again, and again. A little background – I adore nuts. Nut butters, nut sauces, nut flours, candied or spiced nuts, nuts in my yogurt, nuts baked into sweet treats – you name it, I’m nuts for nuts. 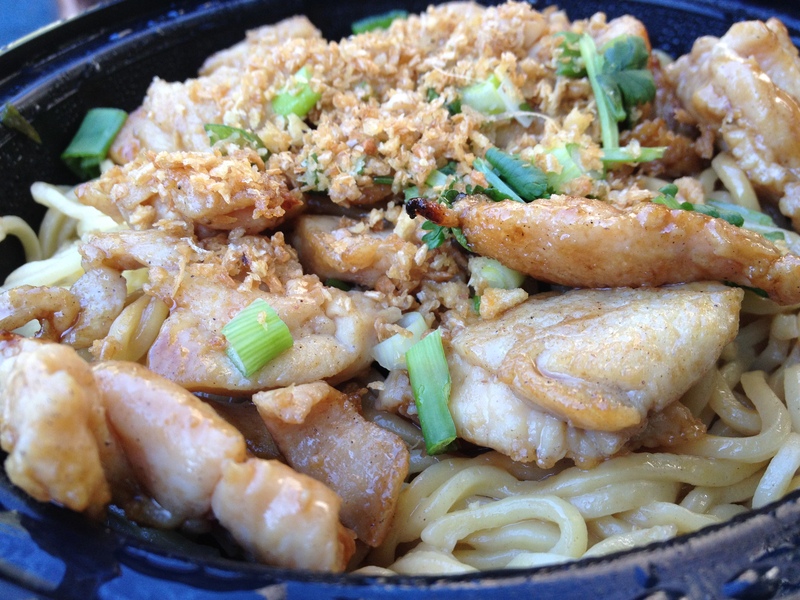 The 7×7 article praised the Noodles with Peanut Sauce so of course we just had to order it. I was giddy with excitement for these house made noodles topped with shrimp, baby scallops, water chestnuts, mushrooms, onions and peas smothered in a spiced peanut sauce to arrive at our table. By the time our other dishes arrived the lunch rush hit, and hit hard, so every employee was running around in a frenzy, giving us no opportunity to inquire about our noodles. It was only when we were finished with our meal that a waiter dropped them at the table topped with a handful of julienned cucumber, but without an explanation as to why they were so late. The dish certainly looked good, but the sauce did not live up to my nutty expectations. The sauce was lackluster – overly spiced and watered down and the noodles held no texture, turning to mush before I even had a chance to chew. Perhaps a result of the overwhelming rush, but I was disappointed. Working as a waitress in a restaurant, I understand that things get chaotic and mistakes happen on occasion. Having been on both sides of the dining experience though, I believe that an apology goes a long way and I would have left a much happier customer if one had been provided. We packed up our leftovers (all 5 boxes of it) and nibbled on fortune cookies after we paid and headed out. As a firm believer in second chances, I have no trouble saying that San Tung hasn’t seen the last of me. I fully intend on returning soon to reunite my taste buds and with that dry fried chicken and give those noodles another try. Maybe I will just try ordering earlier in the day. Nestled in between a corner liquor store and Lily’s Beauty Salon rests a tiny hole in the wall with metal grates on the windows and a small doorway, exposing a diner style kitchen and just a row of bar stools to sit on. Most people walking by don’t expect much, or even see it at all, like me. But on a rare sunny day in the city, my friends Sugi, Julio, Melissa and her daughter, Sol, met up to have a lunch date. This tiny restaurant is where we met. This tiny place called Yamo. Melissa and Sugi swear by it, and confessed to me that they eat here about twice a week. When I peered inside, I saw every bar stool occupied and a line of customers against the wall. Because folks, I gotta tell you, Yamo is a gem. A hidden treasure in a city of great eats. Its greasy, its casual, and its cheap. It’s what I imagine real Burmese street food to taste like. The five of us, we got down. And Curry Prawns and Mushroom, Onions, and Green Peppers (again, sadly not photographed due to rapid consumption). All for $30. What a deal. The women cooking could’ve smoked any competitor on The Food Networks Chopped, that’s how fast they were. Seriously, I think we only had to wait a matter of minutes. 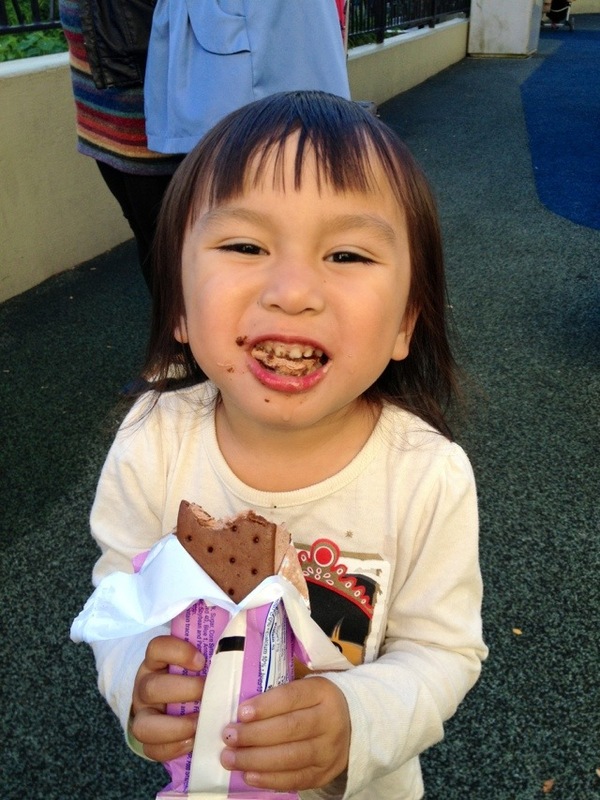 The joint was too packed to eat inside, plus it was gorgeous out, so we grabbed a pile of napkins and chopsticks and we walked a few blocks to a children’s park so Sol, whose 2 1/2, could play. We found a couple of benches, situated ourselves, popped the lids off the to-go containers and feasted. The food was SO good. 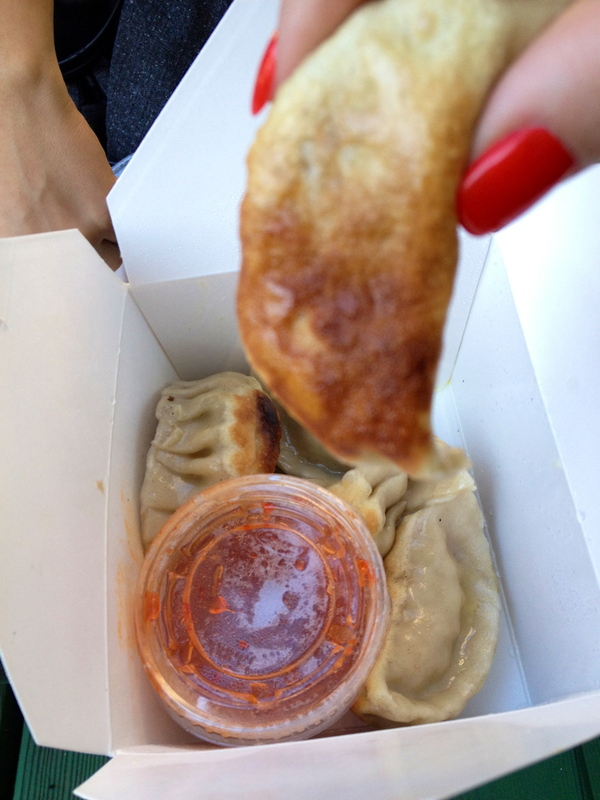 The Pot Stickers had a nice outer crisp but still had chewy dough in some places, and the sauce for them. HOLY CRAP. It wasn’t just your typical sweet chili sauce. 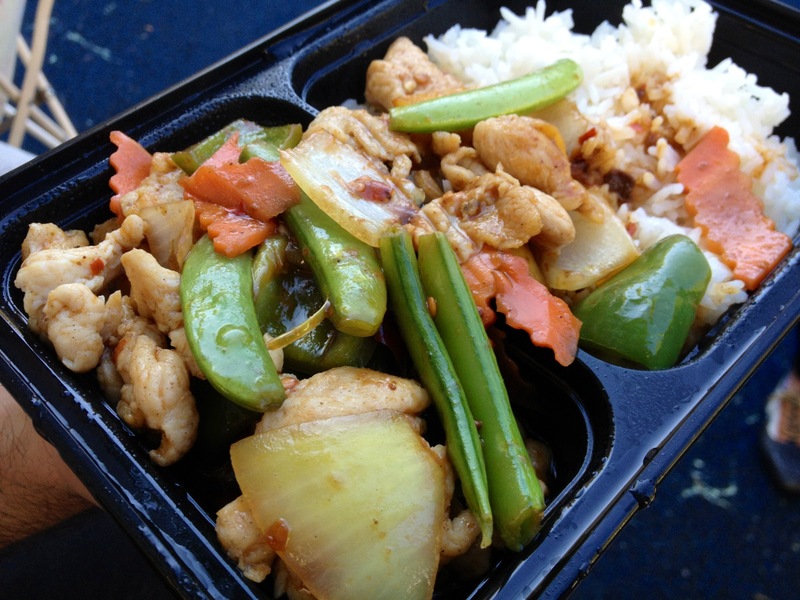 It was a thinner spicier version with chopped up fresh ginger. It was to die for. The Egg Rolls, were pretty amazing, nice crisp and flakey with tons of vegetables. In case you were wondering, yeah, we used the pot sticker sauce on them too. Duh! Julio tried to commandeer the mango chicken, but after a few dirty looks from 3 ladies and a baby, he shared. The first bite explained why he was hesitant to share. It was fantastic! The chicken was moist, the mango sweet, and the vegetables (sugar snap peas and water crescents among the lot) were still super crunchy, which is vital! The curry shrimp was Sol’s favorite, little darling was stuffing whole shrimps in her mouth only after realizing they were too big, thus forcing me to fish it out and hold it while she took modest nibbles. The curry was more like a light glaze as opposed to the typical thicker version, but on a hot day, it was perfect in not weighing us down. Now, on to those Yamo House Noodles. Wow. Just wow. The fried garlic. The Fried Garlic. THE FRIED GARLIC. It was so crunchy, but still so pungent and fresh. It was just phenomenal. The noodles were thick, albeit a little greasy, and the chicken plentiful, there was also a generous sprinkling of green onion on top, which, if you didn’t know, is one of my favorite onions and methods of adding some extra freshness to a dish. When we were all finished we all acted like children, playing house on the jungle gym, running around and screaming, and making friends with other little kids. Sol was THRILLED. Especially when I let her try on my lipstick, so we could play grown ups. Thank God Sol let me get in on this Neapolitan ice cream sandwich, which was also delicious. Basically, if you’re in the Mission, go to Yamo for a great meal. 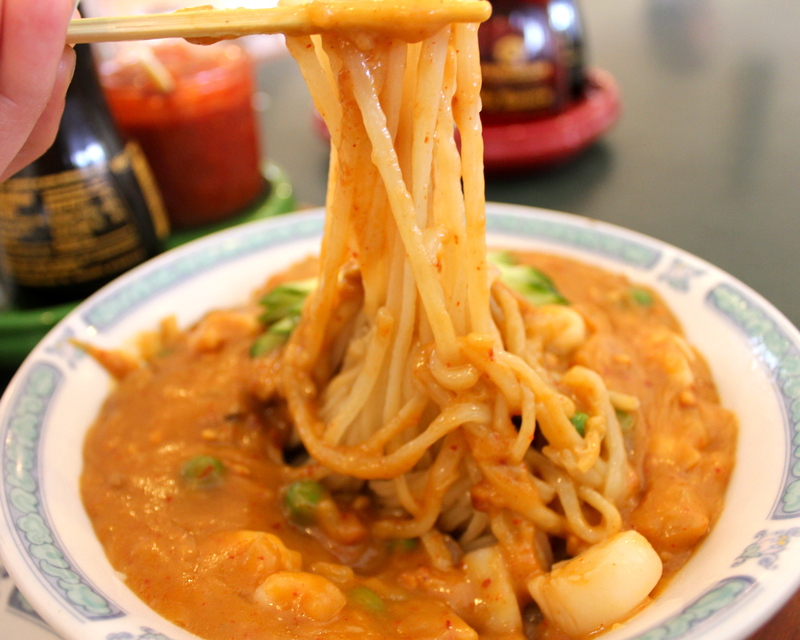 Or, if you’re not in the Mission, head over to the Mission, for a cheap, amazing meal at Yamo.